Awarded One Chef Hat, Catalina is perched along the edge of the water in Rose Bay. The venue offers sweeping panoramic views of the Sydney Harbour from an expansive open dining area containing an impressive indoor and outdoor space. You can watch sail boats, wind surfers, ferries and sea planes float on by. Its location means you can arrive in style, either by sea plane, boat or ferry making it no stranger to celebrities or wedding functions. Today I am here for a different kind of celebration, my girlfriend’s hens lunch, where we sat down to a sumptuous three course semi-set menu for $110 per person. This is the bride-to-be’s favourite dining spot and I can easily see why. $110 semi-set menu also includes bread, chips, salad, coffee/tea and petit fours. Prices quoted below are as they appear on the al la carte menu. Spoilt for choice, I couldn’t decide between a number of items should I have the house smoked salmon, the crispy pork belly, scallops or maybe the oysters that are shucked to order? Yes, life is tough down at Rose Bay! I went with my first choice of house smoked salmon ($30). 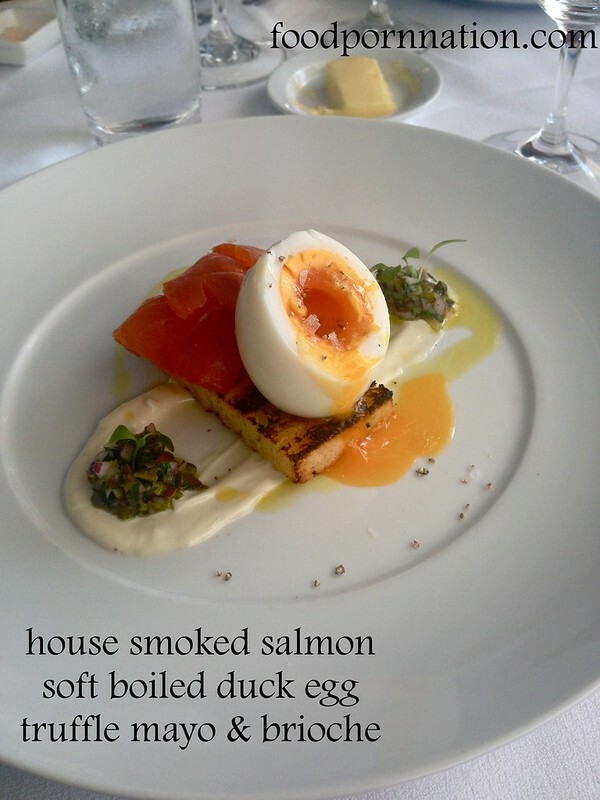 The salmon is smoked, cured and sliced in house and served with a soft boiled egg, truffle mayonnaise, brioche and speckled with capers, pickles and red onion. 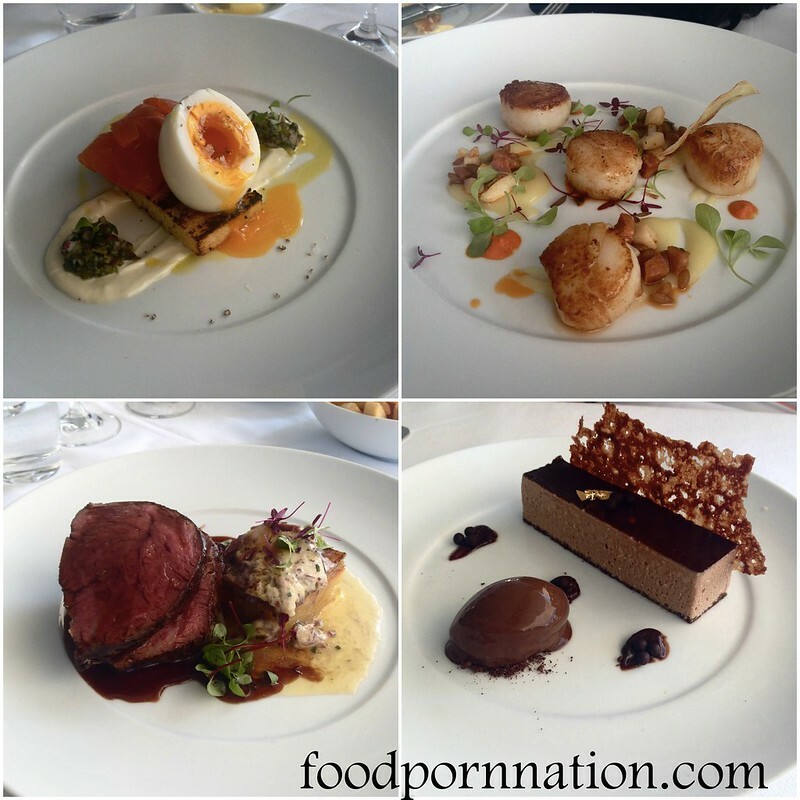 The mixture of the flavours and textures was absolutely sublime. Visually, I love the display of the yolk trickling out and onto the plate. However, I did find the brioche bread underwhelming and slightly burnt for my taste. Scallops with lemon emulsion, chorizo, cuttlefish & piquillo pepper coulis ($34). Crispy skin pork belly with apple remoulade, baby vegetables, smoked celeriac purée and port wine jus ($31). The beef tenderloin was cooked to perfection – medium rare. 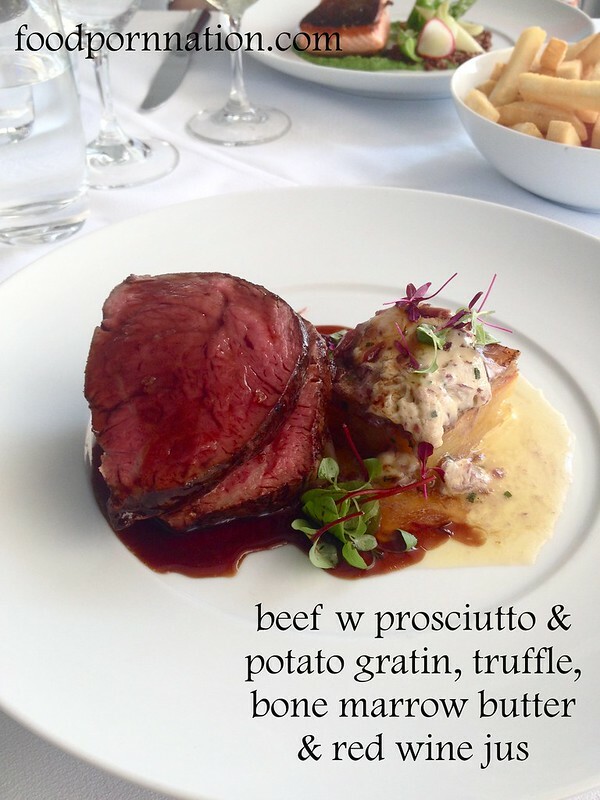 This dish was served with two generous portions of beef and perfumed with a wonderful scent of truffle. The potato gratin was a wonderful accompaniment layered with thin slices of potato and prosciutto, then topped with the most unctuous bone marrow butter. Deliciously creamy and buttery. Flawless in my eyes and my favourite dish of the day. 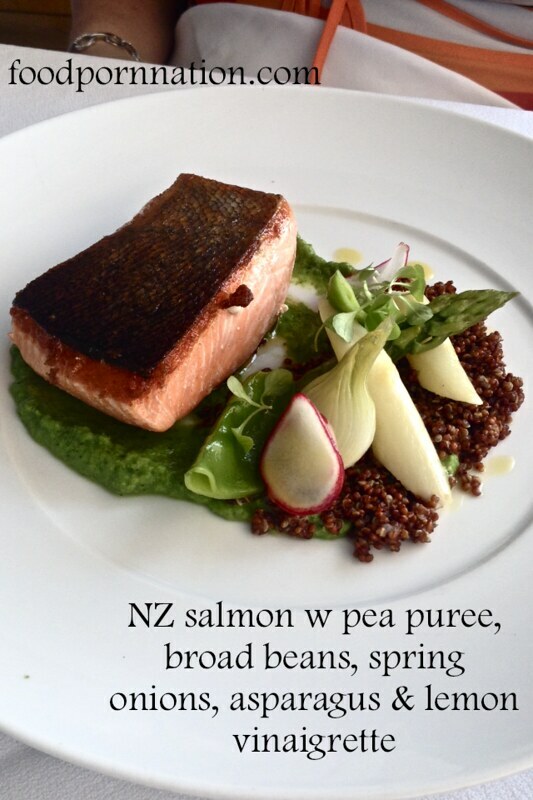 Crispy skin NZ king salmon with pea purée, broad beans, spring onions, asparagus and lemon vinaigrette ($42). 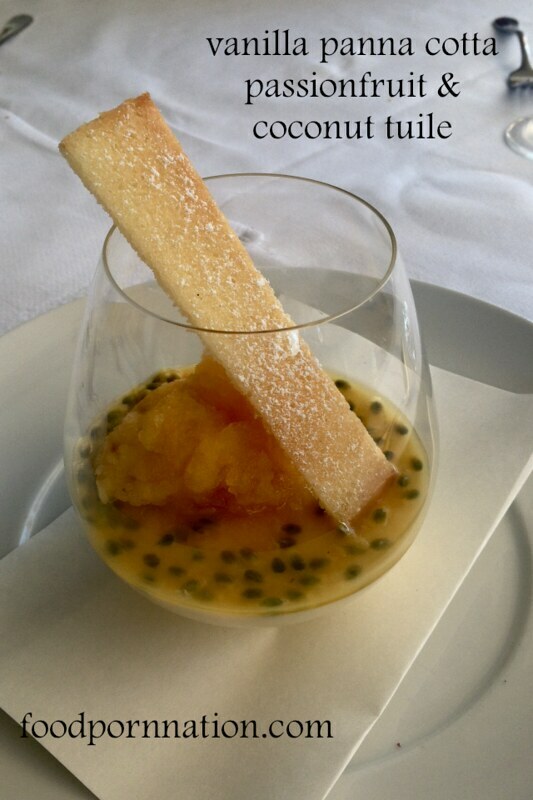 To finish, I chose the vanilla panna cotta with fresh passionfruit, passionfruit granita and coconut tuile ($20), which delivered on all fronts. It was the perfect panna cotta with a refreshing topping of zingy passionfruit to take contrast to the delicate and lightness of the gelatinous creamy base. 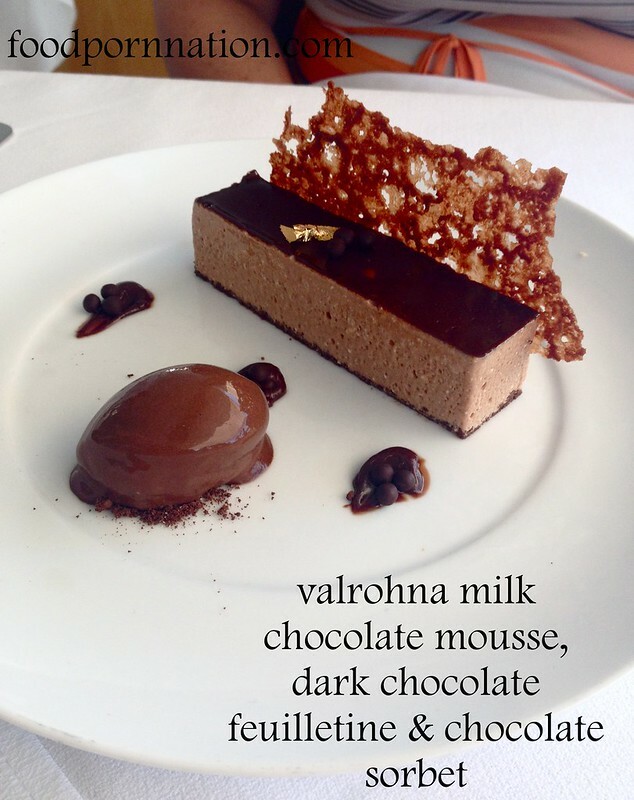 Valrohna milk chocolate mousse, dark chocolate feuilletine and chocolate sorbet ($22). It is very hard to fault the experience at Catalina’s, the food was spectacular if not flawless showcasing that they are not only a limited to all things seafood. Coupled with a gorgeous view on a stunning day it is pretty hard to beat. The service on the whole was friendly and attentive. Although, one wait staff wasn’t particularly helpful when I asked for his recommendations of the menu. He simply replied that he would give me more time and come back for my order, which I wasn’t too pleased about. I did also notice that it was quite slow in between the service of courses taking our lunch to 3 and a half hours. Everything aside, I would recommend you visit Catalina for a lunch visit and to keep everything crossed for glorious weather because it is the view that truly completes the entire experience. ahhh i love catalina, great food and incredible views! I noticed on your blog! But now I love it too! Wow this meal looks incredible! it was absolutely awesome. I can see why it is my gf’s favourite restaurants! 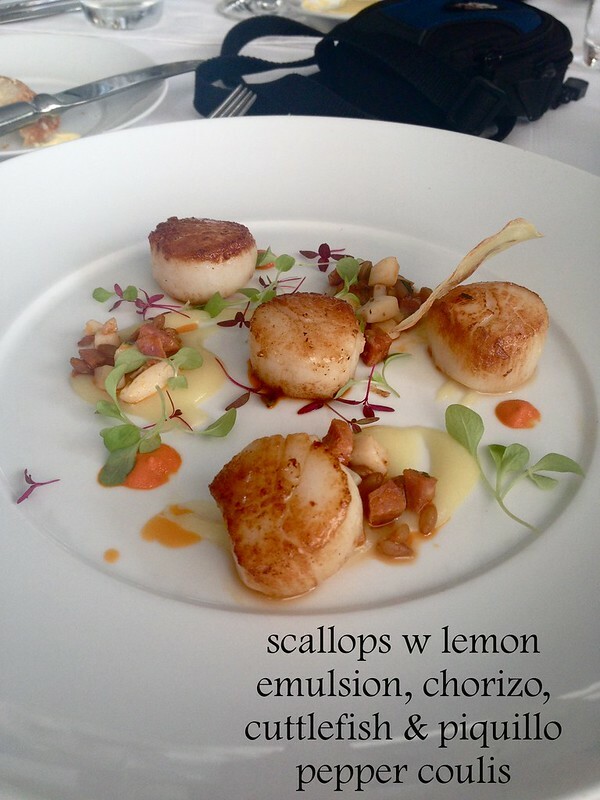 The scallops look perfectly seared! And love the gloss on the chocolate sorbet! I’ll just get my sea plane ready and head over now. can you pick me up on the way? Sea plane’s in the shop. Will have to use the hoverboard instead. Yes, I love the food here! But the dishes take a while to come out but the amazing view makes up for it 🙂 What a lovely hens lunch! Yes service is slow but everything else makes up for it. Best hen’s lunch ever! scallops, pork belly and salmon! wanttttt! hahaha I want it ALL!! Must take the gf here! Wow the presentation of all these dishes are just so stunning! Love Valrhona chocolate, the best chocolate there is!